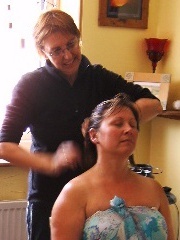 So relaxed – enjoying an Indian Head Massage on the retreat day workshop. Non invasive therapy extremely effective for many common complaints. Indian head massage is massage to the upper back, shoulders, neck and head. This is a non-invasive massage and can be done over clothes if you wish. works with relieving and healing stress, emotional & physical tension, upper body muscular pain, upper body joint discomfort, and so much more . The Indian head massage promotes flexibility of the neck and shoulders, sinus clearing, hair & scalp complaints and sleep problems. It also stimulates the immune system to help the body fight illness and injury naturally… and more! However, you don’t have to have to be suffering from any of the above. Just simply treat yourself to a wonderfully relaxing experience!